Are you feeling bored with your daily work and hanging out on social media with your friends? If so! Then Why don’t you try some exciting fun with your friends? You can have amazing fun with your friends online with best prank websites, where you can use these sites in different ways to prank your friends. We all love to have fun with our loveable friends and family members like sisters and brothers. Playing with them, make them fools, scare little sisters, set some pranks and record their reactions and all these things will become our memories of childhood, and mind some big brother and sisters still do this kind of things to recall their childhood. 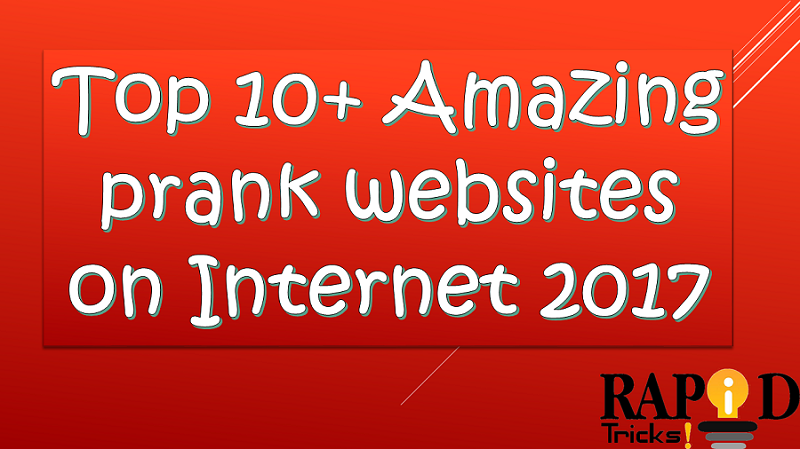 In this post, we are going to share top and funny prank websites with all of you, So you can use these sites to have some amazing fun. There are many peoples who daily search for some exciting fun online, and websites like best prank call websites, best horrible prank sites etc make their day. Yes, here I am going to share some prank websites like these and also I will share those prank websites links here with you. As I have told you above about it that peoples search for prank call websites daily and you also would be one of them. So here we have the best prank call website which you can use to prank your friends. There are many many prank call options available on the website, and you can select any prank call type according to your choice. Here you will have options like “You hit my car prank call“, “Why you call my girlfriend“, “Pizza Delivery prank call” any much more. There are all the call demos available so you can first hear how they work and then you can select the best one for you. So what are you waiting for? Go ahead and prank your friends with many pranks calls available here on “Prank dial” website. This is another prank calling website and it is similar to prank dial website about which I have told you above. This site also has prank call demos which you can use to select which call you want to use. My Phone blaster as the name suggests, this is another prank call website which you can use to call your friends and prank them with different robotic voices. The website is very easy to use just select the prank type and enter the number of your friends and click on call button. Is being a hacker is your dream since childhood? If So! then now, you can show off your friends that you are a hacker with the help of HackerTyper Website. You can use this website to type words like hackers do in Green words on the black screen and you can make your friend fool easily. If you want to do a prank with Windows PC, then this website is made for you. You can use this site to create a fake prank windows 10 update in your browser and you can do this on your friends PC and he/she will be surprised and confuse how it is possible. It is not a website, this is an app called “Yazzy” which allows users to create fake WhatsApp and Facebook messages and mind you this app can be your favorite app once you start using it because we tried it on our friends and they will be shocked and we love that reaction, so you can also do the same with your friends. We all love our Facebook profile and never want to share our FB ID with anyone but how much fun you will get when your friend will be shocked to see that you create a Facebook status on their Facebook wall. It looks so real and for some time your friends will be in shock. This is our favorite website to scare our friends. This website looks like a Facebook profile of a ghost and it looks so scary and if you want to take full advantage of this Facebook profile website then try this on your girl’s friends. Red button is a simple and funny prank website while using it you will definitely have a smile on your face. When you open this website then a red button will be shown on your browser screen with a title “Don’t Press the button”Written over it. It will ask you to not press the Red button and when you press it then it will show you another funny warning. Don’t just read what I say, just try it your self and enjoy the online fun. Google Gravity is a very interesting website, as you can assume by the name of the website, it shows google following the rule of gravity and fall down from the top of your PC screen and break into pieces. You can type and search anything on google gravity same as you search on google. The difference is just this prank site shows the google search engine following the rule of gravity :D. So try this yourself and let us know. Google terminal is funny prank website with all the Google’s different funny and entertaining links. On the main screen of the site, you will see different links and when you click on any of them then the layout of the Google terminal change accordingly. Yes, you heard it right, with the help of this prank website you can update your Facebook status with any device you would like. There are many links available like update your Facebook status via iPhone, via Xbox, via monkeys via Android etc. There are many options available with the link, so you can update your Facebook status via any device and prank your friends. We know you love this post for sure because we have provided you prank weapons such as top and best prank websites and application to scare and prank your friends so you can enjoy the moment with them.